GIVE. Change a life in Renfrew County today! United Way Renfrew County supports local programs that positively change the lives of those in need and works with partners to make a lasting impact in our community. Life’s challenges do not discriminate and are not always visible. Issues like poverty, isolation, violence, illness and grief may affect any one of us at any time. Last year, more than 5,100 people across our 17 municipalities benefited from the services supported by United Way Renfrew County to address these issues. When it comes to our growing senior population, United Way Renfrew County wants to ensure we have the best tools possible to put resources where they are needed most and will have the greatest impact. We just released A Profile of Vulnerable Seniors in the United Counties of Prescott and Russell, Lanark County, and Renfrew County – a report that analyzes the state of vulnerable seniors in our county and makes recommendations to address this emerging issue. 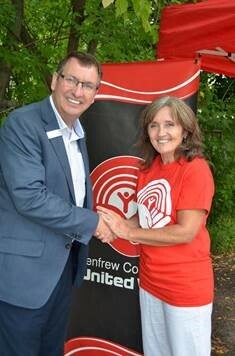 United Way Renfrew County Kicks Off 2018 Fundraising Campaign in Arnprior. On August 22nd, United Way Renfrew County launched its 2018 fundraising campaign in Arnprior with donors, business partners and funded agencies in the attendance who enjoyed a festive atmosphere with a barbecue, bouncy structure, live music and Heritage Radio live. Our goal this year is not a monetary one. Last year, we helped more than 5,100 different individuals. We want to move that number up. With your help, we can change more lives in 2018-2019! Jamie Bramburger, Manager Community & Student Affairs, Algonquin College – Pembroke Campus and 2018 Honorary Campaign Chair, and Pat Lafreniere, United Way Renfrew County Executive Director. In addition to our volunteers, we want to thank the sponsors: Valley Heritage Radio, Giant Tiger, RY-J’S Climbing Adventures, CIBC, More Than A Song Studios and Les Aliments Matrix Inc., Reid Brothers Motor Sales; as well as our supporters: The Town of Arnprior Fire department & Nick Smith Centre and Reid Brothers Motor Sales (Michelle Ménard). (November 2016): Fifth Annual Warden’s Community Service Awards Presented at County Council. PEMBROKE, (ON): County of Renfrew Warden, Peter Emon presented this year’s Warden’s Community Service Awards at November’s session of County Council. The awards were presented in three categories. Renfrew County United Way was honoured as the not-for-profit organization, Pastway Planing was honoured as the recipient of the business category, and Mr. Leonard Hopkins was posthumously honoured with the individual award. Each year, A Selection Review Committee comprised of the County of Renfrew Warden, Chief Administrative Officer, and one member of County Council select the award recipients. Nominees are considered in each of the three categories: Individual Person, Not-for-profit Business, and For-profit Business. 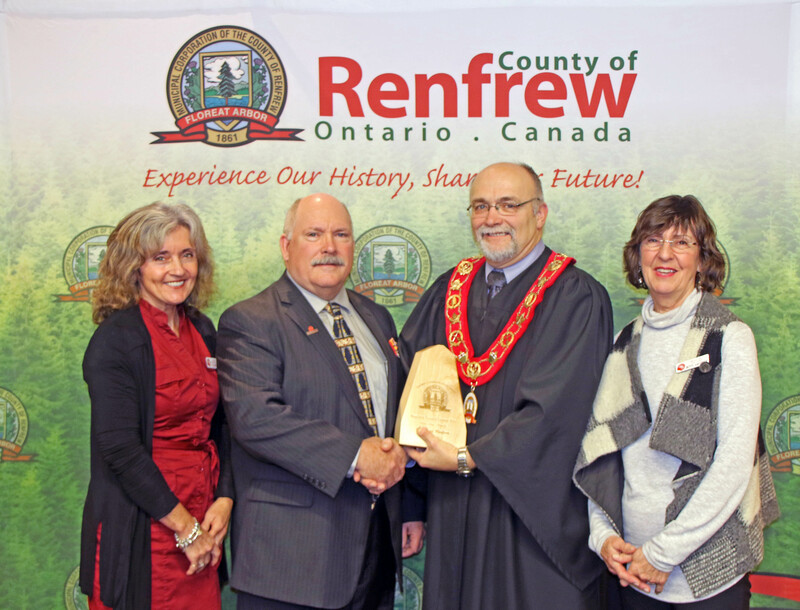 All nominees are considered on the basis of criteria as to how they contribute to the County of Renfrew’s Quality of life.